Aside from the major kinds of pests which can invade our homes there are many other kinds of insect which can make an unwelcome nuisance of themselves. Fortunately, most of these are essentially harmless and relatively simple to control. 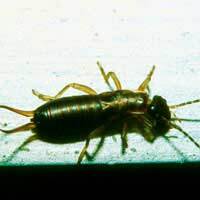 Earwigs are nocturnal insects and normally live outside, hiding during the day in nooks and crannies, though they may come inside during the summer in search of shelter, or in the autumn seeking protection from the onset of colder weather. In the garden, they are something of a mixed blessing, since they have a reputation for causing damage to plants, but also eat aphids and other insect pests. Indoors, they are more of a nuisance than a serious problem. Though they may sometimes eat or contaminate food, they do not spread disease, nor do they pose any risk to health. Although they have functional wings, they seldom fly and enter the home either by crawling in through airbricks or windows, cracks in the masonry or under doors. They may also be carried in, hiding in the folds of newspapers or the petals of cut flowers. Cutting back any long grass or climbing plants close to possible entry points and making good any cracks in the brickwork will reduce the numbers entering, but this alone is unlikely to stop them altogether. Sprinkling a suitable insecticide powder around airbricks and other likely gaps around the building can also help and any earwigs already inside are probably best vacuumed up and released a little way from the house to prevent their return. Adult cockchafers emerge from the soil in May – hence their alternative name of “Maybugs.” Strong fliers, they are often attracted in large numbers to windows and outdoor lights after dark and frequently enter houses. A large, rust brown, heavy bodied beetle up to 35mm long, this insect is another which can be a nuisance, but is essentially harmless. However, the larvae, which are soft-bodied, cream coloured caterpillar-like grubs with brown heads, are an important pest of vegetable crops or grass, since they are voracious feeders on plant roots. While this big insect may look alarming, particularly as the end of its abdomen is elongated and curves downwards, looking remarkably like a sting, it poses no threat and with an adult lifespan of around a fortnight, whatever problems it does cause are inevitably short-lived. Charles Darwin once remarked that his studies of nature had led him to the conclusion that God was enormously fond of beetles – there being something in the region of a third of a million different kinds around the world. It is small wonder then, that they are represented amongst the ranks of occasional invaders of our homes. Ground beetles, for example, beneficial garden insects which feed on caterpillars, slugs and vegetable matter, may come inside from time to time – not to breed, as is sometimes supposed, but more often, simply to shelter from bad weather. An invasion of large numbers of ground beetles is frequently due to some kind of disturbance outside of the building which has ousted them from their normal hiding places. They are unlikely to stay, so simply vacuuming or sweeping them up and returning them outside is likely to be all that is required. Slightly more concerning are the activities of the plaster and fungus beetles, which are minor pests on damp plaster, particularly in new houses and may contaminate food intended for the table. Plaster beetles cause no property damage and can only live in the damp conditions which promotes the growth of the moulds which they eat, though fungus beetles are known to spread mildews and fungi, making them a particular problem for damp stores or warehouses. Closely related to the silverfish, firebrats are brown torpedo-shaped insects, with visible patches of hair and three bristles at their tail end. Favouring a warmer environment than their silvery cousins, they are found in consistently hot places such as around ovens and hot pipes and feed on scraps, preferring material with a high carbohydrate content. The House cricket also favours warm surroundings, scavenging its meals from whatever kind of food or refuse is available to it. More commonly associated with boiler rooms, bakeries and commercial kitchens, this 20mm long nocturnal insect is often detected only by its bird-like warbling “song”. The cricket can be a serious pest, since its feeding habits mean it can readily contaminate food destined for human consumption. In both cases, control generally involves ensuring that all potential sources of food are denied them and treating likely hiding places with insecticides sprays or powders of the kind sold to deal with “crawling insects”. For these and most other occasional invaders, simple exercises in good housekeeping will suffice, though sometimes, more drastic measures will be required to get your home back to yourself.